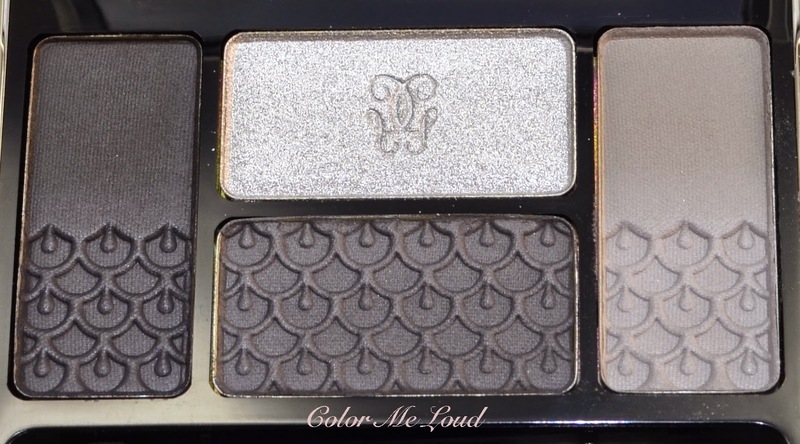 This fall Guerlain brought us three new palettes in their buttery smooth and pigmented formula. I can never resist a new Ecrin 4 Couleurs so ended up getting all three. I have already swatched them together (check out this post) and reviewed two of them with FOTDs, #15 Les Sables (reviewed here) and #17 Les Violines (check here). 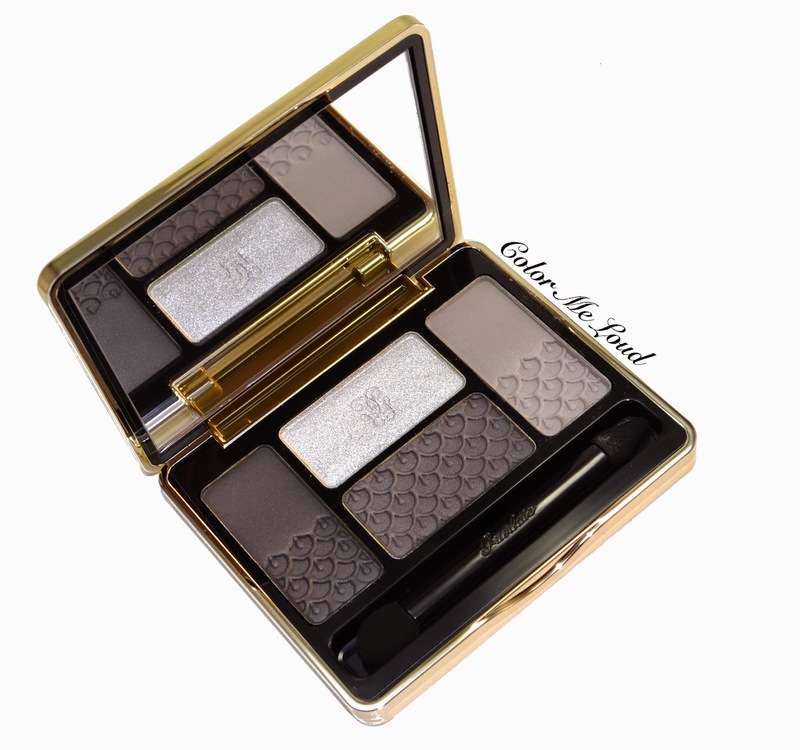 Guerlain Ecrin 4 Couleurs #16 Les Aciers is going to be my last review post for Guerlain's Fall Collection. 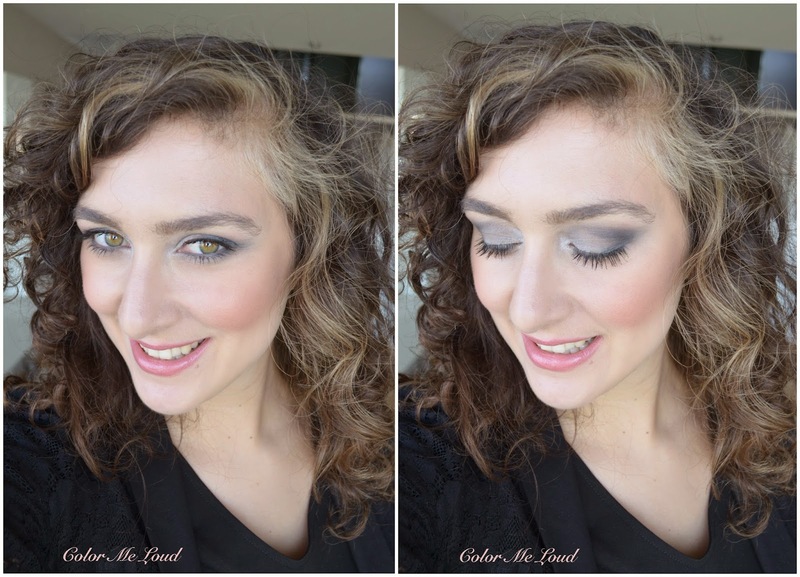 Check out this and that post for Kiss Kiss Lipstick reviews and swatches too. The steels quad, Les Aciers has a similar concept to Les Sables, in which there are three matte to satin shades combined with one metallic/shimmery shade. New quads are characterized by their embossed design pattern on the lower half of the compact. 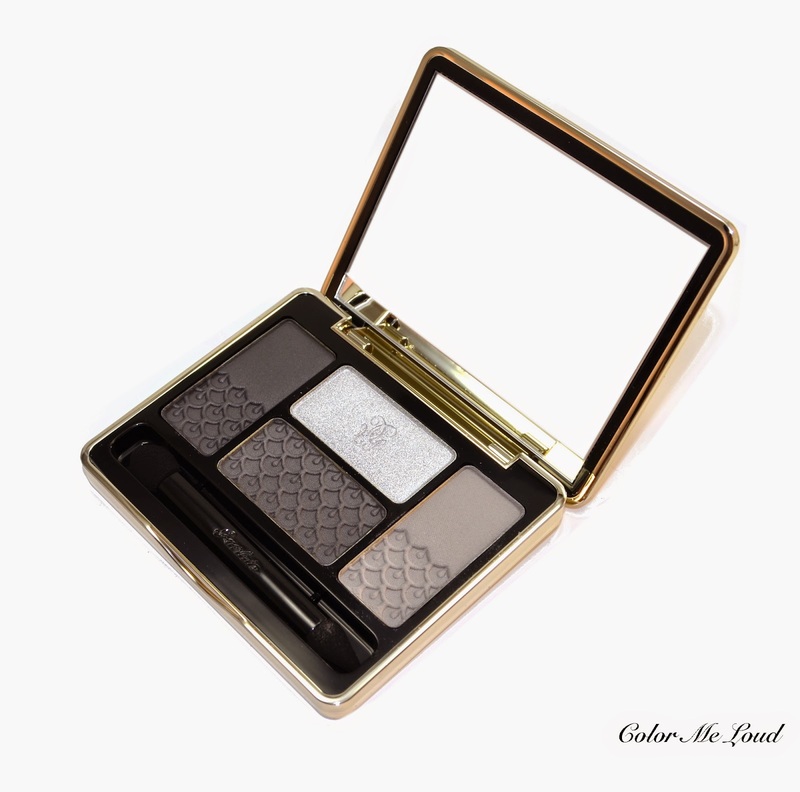 The compact and the formula are the same as the existing Guerlain Ecrin 4 Couleurs. 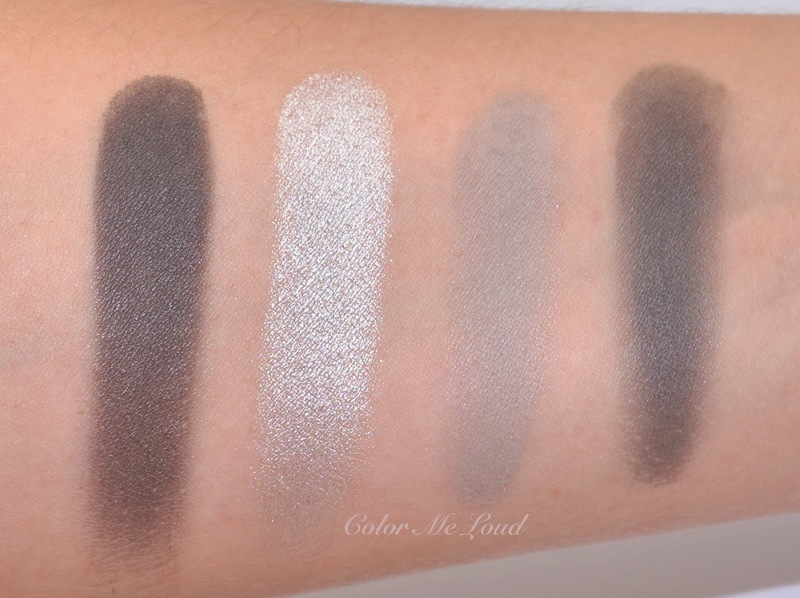 Les Aciers is the classical smokey eye palette with grays and silvers. What I like about them is that the shades are not very cool. Sometimes silver and grey tones crashes against my skin tone but with Les Aciers this doesn't happen to a degree that is looking unnatural. Especially the darkest shades have some warmth to them. Left: Very deep charcoal with satin finish which has slight taupe/brown undertones and therefore it is not very cool. Top: Very pale grey/silver with frosty finish. It is a great shade for inner one third of the lid or inner corner highlight. I like the fact that this can be layered on other shades to obtain a shimmery finish. Right: Light grey with matte finish. It is the coolest shade of the palette, great for blending out the darker shades or to use all over the lid. Bottom: Very deep grey with matte finish. It didn't swatch as intense as the left shade but left and bottom shades are very close, other slight difference in their finishes (matte vs. satin to matte). Again great texture. Below I am wearing the lightest shade on the inner corner, blended on the 1/3 of the upper lid. On the lid I have the matte medium grey shade and the deepest shade on the crease. I then applied a dark grey eye pencil and mascara. You can see that one my right eye (from your perspective) it looks like as if the medium grey color doesn't apply smoothly to cover the lid. The formula isn't to blame here. It is the color against my skin giving this effect, which shows itself more on the photos than in real life. Below you can see this eye look in context. I am wearing Chanel Joues Contraste Rose Glacier (reviewed here) on the cheeks, Guerlain Kiss Kiss Rosy Boop (reviewed here) on the lips. I love the combo and I think Les Aciers do combine beautifully with them. Final thoughts: I am not all that big on grey/silver/black combos but all in all I like Les Aciers more than I like the palettes with similar color theme. The formula is great, I love the shimmery shade which can be layered on the mattes in the quad. Guerlain's matte formula is one of the best out there, it is buttery smooth and very pigmented without being powdery so thumbs up for that. As a black palette though, my heart still belongs to Les Noirs from their line. From Kiss Kiss Collection, my preference of quads are in this order (from high to low): Les Violines, Les Aciers and Less Sables. -> That typo with two "s" tells it all, I couldn't make the shades in Les Sables work on me but I am sure on different complexions, they are just fine. What is your favorite Guerlain Ecrin 4 Couleurs? Hi! I love your blog, always come here first every day! Congratulations on having your dream nail polish color selected as a finalist in the Rescue Beauty Lounge 'Fan Collection'! Thanks so much, I am so thrilled, I am on holiday and on the way at the moment, I don't know if I can ask for votes and all kinds of stuff... Hope that works nevertheless. I love Rose Glacier on you, Sara!! So pretty! You make everything look amazing! Out of the 3 new palettes, I wanted this the least, but I can definitely tell the quality is superb, so if I'm ever looking for a grey palette, this might be it! You are right, I love this one most out of my grey palettes but I am not fan of greasy either. Since I have this one now, I don't need any other grays anymore lol. Quality is indeed superb. Which one of the palettes do you like most? I really loved the textures of these new 4 Ecrins... but greys make me nervous... i've never had any luck with grey palettes. Black i can werk, anything but grey. But somehow you just make magic! you can wear blues so well, even the baby blue ones which I am soo afraid of, so I can't think of you not being able to pull off grays. Actually I love Les Noirs from Guerlain more than that one. Do you have it?